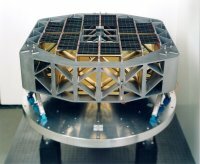 Privileged visitors to the ESTEC clean rooms during the final integration of XMM-Newton noticed that after the installation of the flight-model mirror modules, there appeared to be something missing. Only two of the three mirror modules project out of the support platform. The lack of symmetry stems from the fact that only two of the mirror modules are equipped at their exit with reflection grating arrays. With the associated cameras, they are part of the Reflection Grating Spectrometer (RGS) component of the XMM-Newton mission. Dispersive spectroscopy fans out X-ray photons much as a prism does with visible light. 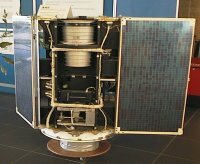 It was a relatively new technique at the time and XMM-Newton is the first ever X-ray space observatory to be equipped with reflection gratings operating in the X-ray band of the electromagnetic spectrum. Early X-ray missions carried Bragg-crystal spectrometers; later missions like EXOSAT (1983) used transmission gratings. XMM-Newton is the first mission to use the latest technology which makes it possible to produce large reflection grating plates, giving simultaneously a high spectral resolution and throughput. A reflection grating is a mirror with tightly controlled grooves on it, in the case of RGS about 645 grooves per mm, equivalent to 65 grooves in the width of an average human hair! X-rays reflected off the top and the valley of the grooves interfere with each other and cause a spectral image whereby X-rays of different wavelength (or energy) are reflected under slightly different angles. The two reflection grating arrays (RGA) on XMM-Newton are each composed of 182 such grating plates. Each plate consists of a silicon carbide substrate coated with a thin (2000 Å) film of gold. Measuring 10 × 20 cm, they were produced by a replication process from a mechanically ruled master. The grating plates, with stiffening ribs on their rear side, are integrated onto a beryllium support structure. One of the RGS cameras tucked behind its cooling radiator. The opening in the black radiator shows the connection to the cold finger that cools the inside of the camera. Once splayed out into a spectrum, the X-rays are focused on the two RGS cameras in the spectral focal plane geometrically offset with regard to the EPIC cameras. The two grating arrays disperse about 40 per cent of the incoming light onto the RGS cameras, while 44 per cent of the radiation is directed onto the EPIC cameras at the telescope's prime focus. The remaining light is absorbed by the support structures of the RGAs. The RGS cameras are composed of a strip of nine MOS CCDs developed by the EEV Ltd. Chelmsford (UK), and under the guidance of the Sensor Technology Development group at SRON Utrecht. These back-illuminated CCDs are operated in single photon counting and frame transfer mode, and for each photon they very accurately measure its position on the detector and its energy. From the photon positions the high resolution X-ray spectrum as diffracted by the grating array is determined. Combining the energy and position information allows to separate the contributions from the various overlapping grating orders. To reduce background noise, the cameras are operated nominally at -80°C, and they can operate down to -120 °C. This temperature is provided by the coldness of space captured by two passive radiators on the outside of the spacecraft. 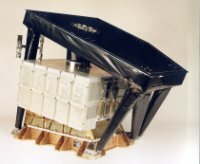 The thermal model of the Dutch ANS X-ray satellite, which started non-solar experimental X-ray astronomy in the Netherlands, and was launched in 1974. The other partners in the RGS consortium are: the Mullard Space Science Laboratory (MSSL), UK, has provided the digital electronics and the on-board data handling software; the Paul Scherrer Institute (PSI) in Villigen, Switzerland, responsible for the structure and thermal design of the RGS cameras built by Contraves Space. The RGS reflection grating assemblies and cameras together with all the associated flight-electronics were tested at the Panter long beam X-ray test facility of the Max Planck Institute for Extraterrestrial Physics at Garching. The spectral data provided by the CCDs of the RGS cameras is typically presented as a curve displaying the presence, seen as peaks or lines, of certain elements (such as iron, oxygen, silicon) in the X-ray source under observation. For astrophysical sources, the positions and sizes of the peaks in the spectrum are a measure of the temperature and the relative abundance of the different elements, respectively. The data can also provide clues as to the density of the emitting gas. The main ('first spectral order') curve will be accompanied by a second or third order curve, produced by the reflection grating assembly. A sample RGS spectrum obtained at the long-beam facility at the Panter test facility. The upper graph shows the presence of different elements; the lower one shows the first and higher order spectra, separated from one another by the intrinsic resolution of the CCDs. The wavelength band chosen for RGS (5 - 35 Å) contains the K-shell transitions of oxygen, neon, magnesium, aluminium, silicon, as well as the L-shell transitions of iron. Each time one of these transitions takes place in the atom, a distinct amount of energy is released, in the form of a photon. So, different atomic transitions generate photons with different energies, which in turn show up as different spectral lines in the X-ray spectrum. Detailed study of these spectral features allows the physical characteristics (density, temperature, ionisation state, element abundances, mass motions and redshift) of the emitting region and its surrounding environment. XMM-Newton makes it possible to study these spectral features in many types of astrophysical objects like stellar coronas, binary star systems, supernova remnants, clusters of galaxies and distant active galactic nuclei. 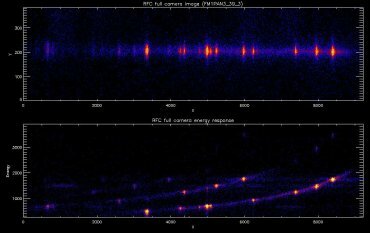 X-ray spectroscopy can also be useful to astronomers investigating gamma-ray bursts, which can also be observed at X-ray wavelengths. Like the 'after-glow' observations made by the BeppoSAX satellite (Italy-Netherlands 1996), XMM-Newton is also able to contribute to an understanding of these phenomenally powerful and mysterious bursts of gamma rays.